KINGSTON – Jamaica’s Minister of Tourism Edmund Bartlett says tourism remains the most vital source of earnings and economic activity for the majority of Caribbean islands, with region-wide revenues estimated at more than US$27 billion. “Tourism is the single largest generator of foreign exchange in 16 of the 28 countries in the Caribbean, with the sector receiving the most by way of foreign direct investment (FDI),” he pointed out. He noted that the Caribbean has a higher proportion of total employment and percentage of gross domestic product (GDP) derived from tourism than any other region in the world. It is estimated that one in every four persons is employed in tourism-related activities, and the sector accounts for 41 per cent of all exports and services in the Caribbean and 31 per cent of all GDP. “These economic indicators confirm what most of us as key players and stakeholders in the sector already know; that is, unmasking the full economic potential of tourism remains at the heart of the region’s quest to promote sustainable and inclusive growth,” he said. Bartlett, who was part of a discussion panel at the 47th Annual Meeting of the Board of Governors of the Caribbean Development Bank (CDB) in the Turks and Caicos Islands on May 25, noted that despite early forecasts for a downturn in tourism performance for 2016, the Caribbean witnessed an unprecedented growth of 4.2 per cent in visitor arrivals. “The region welcomed a historic 29 million visitors in 2016, over one million more than in 2015,” he informed. 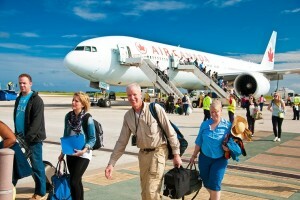 Bartlett said that tourism growth in the region outpaced the global average of 3.9 per cent. The data also indicate that cruise tourism in the region is booming, as passenger arrivals grew by an estimated 1.3 per cent to approximately 26.3 million in 2016. The minister said that while the sector is booming, tourism authorities cannot afford to become complacent, but must continue to explore new and innovative strategies to take advantage of the vast economic opportunities that can be generated from tourism and tourism-related activities. “Specifically, our eminent tourism master plans must foremost address the perennial concern among a large number of citizens that the tourism sector has failed to forge robust linkages with the wider domestic economies of Caribbean territories,” he pointed out. He said that as policymakers and stakeholders, “we must immediately and decisively respond to this challenge by identifying a comprehensive multi-sector policy and implementation framework for strengthening current tourism linkages and identifying new areas of potential linkages. “This is with a view of maximising the potential of the tourism sector for generating sustainable economic livelihoods for a larger number of locals, particularly those residing in communities in and around resort areas,” Bartlett added.